Demon tagged as Hard Rock? This must be a mistake, you mean NWoBHM. No, I most certainly DON’T. 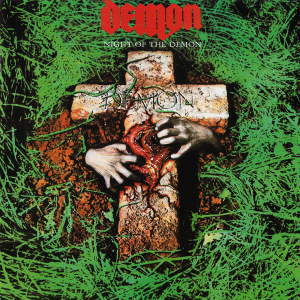 The first two Demon albums had more in common with say UFO or Thin Lizzy (can you say the same about their peers? I don’t think so), so please indulge me. If you bother to look beyond the *Evil* image [name/cover/lyrics etc], you’ll come to the same conclusion. For years I had this hideous 2in1 Combo Edition issued by ZYX Metallic which didn’t do the band justice. The idea behind budget issues is to cut cost, I understand that. But merging the covers, thus completely destroying the artwork, is UN·AC·CEPT·A·BLE! Whoever took that decision managed to cripple two of the finest albums of the early 80s. This 2002 Remaster by Spaced Out Music is no *Deluxe Edition* either [4-page booklet, no photos, very little information on how the band was formed/the recording sessions/the reception by press & fans etc.] but at least it’s decent and was certainly worth the 8 quid I paid on Amazon. ★8 out of 10 overall, containing 3 truly classic songs. “Night of the Demon” & “Into the nightmare” are straight 10s, “One helluva night” is a 9er. Wow, this is a wonderful site with lots of interesting stuff. 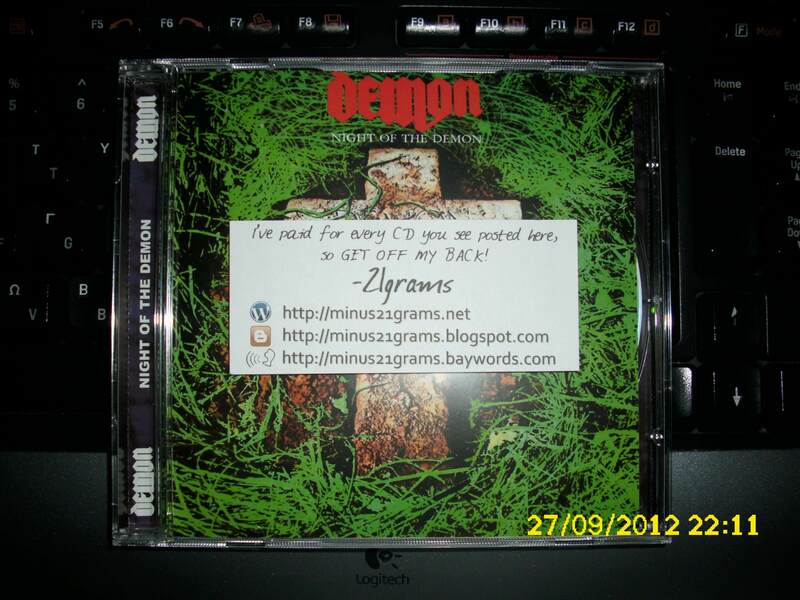 Huge thanks for the Demon post! Any chance for “The unexpected guest”? Keep up the nice work and thanks again. I have this Reissue… Fantastic job done on a great Hard Rock album. I’d like to echo the request for “The unexpected guest” at some future point, please. I played this again only the other day and, considering the date and the fact that they were English, the album sounds fantastic. Even at release it sounded great. I loved the first 3 albums, but they lost me after that. ¡Muchas gracias por el disco, mil gracias! Is it a glitch I’m hearing at track #4, “Father of time”, @2:56? OK sorry, but that sound wasn’t there in the original. Are you referring to the sound in general (throughout the album) or a specific point? Remasters are by definition different [theoretically *better*, but that’s not always the case] compared to the original recordings. Glitches on the other hand, have nothing to do with the (Re)Mastering process. No, the sound quality of the album is great. It’s just *something* I hear at 2:56 while Dave Hill sings “Flames burnin’ high”. I have to say, I like that you add your albums in Discogs, I think that site is great. I agree with you about watermarking images when people use them for pirating. Sorry for my horrible English and thanks for creating this blog. I went through that part (2:50 up to 3:10) several times just to be on the safe side. -21grams, thank you for the answer. Hey, can you post an alternative link for the FLAC rar? Here in Brazil Uptobox.com has been blocked since last April.